Thousands of BMB alums echo countless memories that make the Blugold Marching Band the vibrant, life-changing experience it has become. The BMB impacts lives and spawns unforgettable memories that are sure to last a lifetime. Below are the highlights of the last 19 seasons with a few pictures to illustrate the legacy of a band that has grown from 60 to an astounding 400+ members. 2018 was the biggest and baddest year yet. The BMB reached 400 members, making it the largest band in the Midwest. Performance highlights for the year included: four Blugold home games, the opening of the Pablo Center at the Confluence in Downtown Eau Claire, the International Fall Festival, Music Along The Chippewa, Youth In Music in Minneapolis, the Bands Of America Super Regionals in St. Louis, and an indoor stage show in the new Pablo Center at the Confluence. 2017 was a fun-filled season and the exuberant show aimed to please a wide audience. In addition to Blugold home games and Music Along the Chippewa, the BMB traveled to Chicago and Waukesha for the Chicagoland Marching Festival and the Waukesha West shows. At the end of the season the band flew to Singapore, then cruised to Malaysia and Thailand onboard Royal Caribbean’s Mariner of the Seas before flying on to Bali to complete an exciting 19-day International Performance Tour. The 2016 was a season to remember as the band fielded more than 350 members. Dr. Ward Miller (Blue Stars Drum & Bugle Corps) joined the BMB staff as a special consultant and helped to produced a show that showed a new focus and direction for the BMB. The band was the feature exhibition group for Bands of America Super Regionals in Indianapolis as well as Music Along the Chippewa. BMB was among the first bands to christen the new US Bank Stadium in Minneapolis for Youth In Music. The season of 2015 was by far one of the loudest and most interesting seasons at this point. The BMB chose a Latin theme to spice up the audiences and hopefully make them want to get up and dance. The wide range of performances included Youth In Music in Minneapolis, Music Along The Chippewa, Greendale and Chicagoland shows. At the close of the regular season BMB carried the beat to Europe with a trip to Barcelona, Spain followed by a cruise around the Mediterranean with stops on several islands and in Italy on the Norwegian Epic. 2014 moved in a new direction for the BMB, culminating in a special exhibition performance at the Bands of America Super Regionals in Lucas Oil Stadium in Indianapolis. 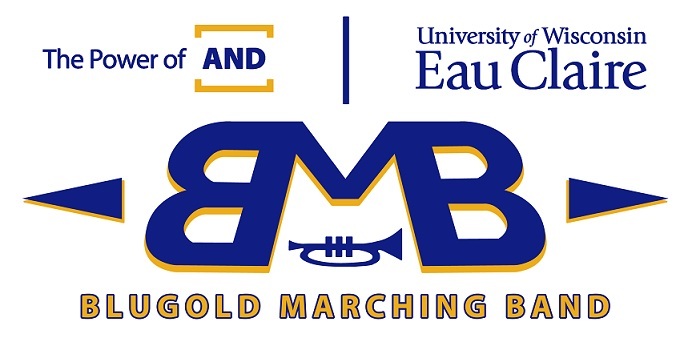 In addition to the four Blugold home games and parade/stage show at the Eau Claire International Festival the BMB performed a record number of high school exhibitions including Chippewa Falls, Cumberland, and Youth in Music. The BMB was also the focus of more media attention than ever with the production of the documentary "Pride [AND] Performance" and a nationally syndicated segment on "The Real Winning Edge" that featured our solo twirler Briar Swann. The 2013 season was packed full of excitement including Blugold home games, high school football games at EC North and Chippewa Falls, and contest exhibitions at Cumberland, Lincoln-Way Illinois, and Youth in Music. The BMB was also thrilled to perform at the Chancellor James Schmidt's inauguration in November. At the end of the regular season members of the BMB flew to Tokyo, Japan where they spent two vacation days before proceeding to Singapore where they spent four days, then began a Performance Cruise Tour aboard Royal Caribbean's Mariner of the Seas. The BMB was a featured performing act on the roundtrip passage to Kuala Lumpur, Malaysia and Phuket, Thailand. 2012 was the most exciting season yet for the BMB. The band performed four Blugold home games, a parade and stage show at the Eau Claire International Festival, an exhibition at Music Along the Chippewa contest, and another exhibition at the Youth in Music Grand Championships in the HHH Metrodome. The finale came in late October with a trip to St. Louis, Missouri to perform at the Bands of America (BOA) Super Regionals. The BMB was one of just two collegiate bands invited to BOA St Louis and performed to what may be the most enthusiastic and responsive audiences in BMB history. Over 9,000 high school students and fans stood and cheered continuously throughout the show. The 2011 season included five Blugold games, exhibitions in Naperville (IL), Menomonie (WI), and the Youth in Music (MN). added a new dimension that will become a regular activity on the BMB schedule - cruising! After a full regular season of football games, contest exhibitions, and a trip to Chicago 170 of the 300 BMB members traveled to Rome where they boarded a cruise ship and set sail for Greece, Turkey, and Israel. Members of the BMB were featured performers on the Costa Serena cruise ship where they played three concerts to capacity crowds (seating 1350) and standing ovations. 2010 was an exciting season as the BMB added several new venues to its already full performance slate. The band traveled to North Central College (IL) for its first away game since 2004 and performed at the Warrens Cranberry Festival. One of the highlights of the season was the halftime show for the Minnesota Vikings vs Miami Dolphins game in September. 2009 was another record breaking year in terms of total enrollment (272), number of applications (300+), and variety of performances. After a full home season, members of the BMB traveled to Europe where they performed stage shows in Venice, at Notre Dame Cathedral and the Eiffel Tower in Paris. In 2008 the BMB gave more performances than ever before including shows in Chicago, Minneapolis, Green Bay, Chippewa Falls, Menomonie, and five appearances on campus. A record breaking 232 BMB members rocked out to classic rock tunes that had the audience singing along. In 2007 the Blugold Marching Band performed in 8 cities and 4 countries for a combined audience of more than 200,000 people. The “What’s Hot” theme was designed for international audiences in Italy, Greece, and Vatican City. The band performed field exhibitions in Chippewa Falls, Waukesha, and the Metrodome then premiered its stage show in Zorn Area before taking it to Vatican City, Rome, Florence, and Athens. The 2006 season featured the BMB's highest energy performance yet. The music of Aerosmith rocked not only the 192 member BMB but the crowd as well. The performance schedule included trips to Irondale, Chippewa Falls, and the Youth in Music Championships in the Minneapolis Metrodome. 2005 "The Music of Gloria Estefan"
The 2005 Blugold Marching Band season was undeniably the best season to that point as the BMB performed at four Blugold football games, Music Along the Chippewa, the Greendale Marching Festival, the EC North vs EC Memorial game, and the Parade of Nations. BMB membership stood at all all-time high of 171 members. Carson Park was the scene of one giant Miami - South Beach party when the Blugold Marching Band took the field. It was the most fun season ever as the BMB partied to the music of Gloria Estefan. The 2005 season was also the beginning of a new BMB tradition - staged choreography in sections and pull-out dance groups. In 2004 the hardest working band in Wisconsin teamed up with the hardest working man in show business to bring audiences the music of James Brown. The Blugold Marching Band took its new funky factory image to a higher level. A major component of the band's makeover was the addition of the band's makeover was the addition of a new dance line. Six members of the University Dance Team joined the BMB to enhance the James Brown theme. Alongside the dancers was a new star in the BMB crown - featured twirler, Emily Schneider. The musical program included excerpts from many of James Brown's hits. Opener: Gotta Gimme Some More, Papa's Got a Brand New Bag. Closer: I Got You, Living in America, reprise of Georgia. 2003 "Old School Michael Jackson"
The 2003 season was dubbed "Bigger and Better Than Ever!" with good reason. It was the first time the Blugold Marching Band topped 100 members. It also marked the beginning of a new era in BMB energy. The Michael Jackson show featured many of Michael's hits but concentrated on his earlier years from Jackson Five through the 1980's. The band updated its image in 2003 by replacing its 17 year-old uniform accessories with more modern ones. A cape was added and the old shoulder nests were replaced by shoulder cords and a Wisconsin patch. The old yellow plume was replaced by a taller white plume. During the first few rebuilding years the BMB experimented with various forms of rock music. Although the band was still small there was a growing enthusiasm and for the first time the group had several non-music majors. In many ways 2001 was the most difficult year because there was mixed reaction to trying to create a marching band within the ranks of music education majors. A small group of students bought into the idea but the rest were content to leave the group as it was. 2001 saw the purchase of six silver sousaphones, doubling the size of the section. The musical program was arranged for the band by George Brozak. Opener: Soul With a Capital "S"
Fall of 2000 was Dickerson's first year at UW-Eau Claire and the handful of people who signed up for marching band weren't sure what they were in for. No one knew the roster until the first day of classes so the band had to begin designing the first show at the first rehearsal. There were 36 wind players and 13 drummers. Drum Majors and Color Guard members were chosen on the spot and the musical program was a hodgepodge of what could be found in the library. The band was ambitious enough to attempt two difficult arrangements but never got beyond a few simple drill moves.